We are a family operating company and our mission is to make sure that the visitors to Greece have a unique and unforgettable holiday, in our area (Arcadia county), or elsewhere in mainland Greece or the islands. We can find the right accommodation, and make all the related arrangements for the perfect holiday, whatever the requirements are. If you are interested in buying or long-term renting, we can help you to find the right property through our Alphaproperty agency- www.alphaproperty.gr. 1. We are located 3 km off the main Eastern Peloponnesus coast road which connects Argos with Astros and Leonidio. To/from the Eleftherios Venizelos International Airport east of Athens, by scheduled and charter services. 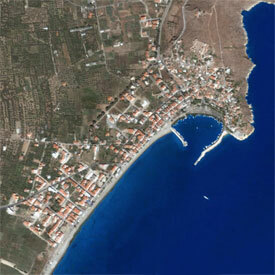 To/from Kalamata airport, by scheduled internal services and by charter services from overseas. a. Taxi, which we can arrange to meet you at the airport. b. A car from a rental car company of your choice which we can book with better prices. c. Bus X93 from Eleftherios Venizelos International Airport to the Kifissos Bus Terminal in Athens (about 45 minutes), and onward to Paralio Astros. Express Bus X93 connects the Arrivals Hall (furthest end) at Venizelos airport in Athens with the intercity bus station of Kifisos. It operates every 35-40 minutes from 6:05am to 1:05am, and every hour from 1:05 am to 6:05am; the journey takes about 60 minutes depending on the traffic. In Kifissos bus terminal, you take the bus on the Astros/Leonidio route (Arkadia line) directly to Paralio Astros. The scheduled buses from Athens bus terminal are: Daily 7:45, 11:15, and 16:00. Every Friday there is an additional bus at 18:30. The price is about 15.00 euros. The trip usually takes about two and a half hours, including a short stop for coffee. 1 From Athens Kifissos bus station by scheduled KTEL Arkadia services to Paralio Astros via Argos, or by scheduled KTEL Argolica services to Argos and then by taxi, also from Nafplio, Porto Heli and Spetse via Argos, and from Sparti via Tripoli. 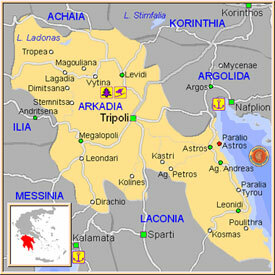 2 From Tripoli and Patras by scheduled KTEL Arkadia services. 1 By the scenic (and actually quite punctual!) Peloponnesus railway line from Athens, from Kalamata, and from Patras via Corinth railway station, to Argos and then by taxi.